KPMG Cyprus will hold the 2nd Marathon for the development of applications on innovative technologies in the field of technologies that disrupt the Insurance industry, on 18 – 20 January 2019 at KPMG premises (Esperidon 14, Nicosia). Crowdhackathon cy #insurtech 2 is coordinated with the technological and operational support of the innovation company Crowdpolicy. Crowdhackathon cy #insurtech 2, will focus on the creation of innovative applications (Minimum Viable Products – MVP) in the wider insurance sector (#insurtech). 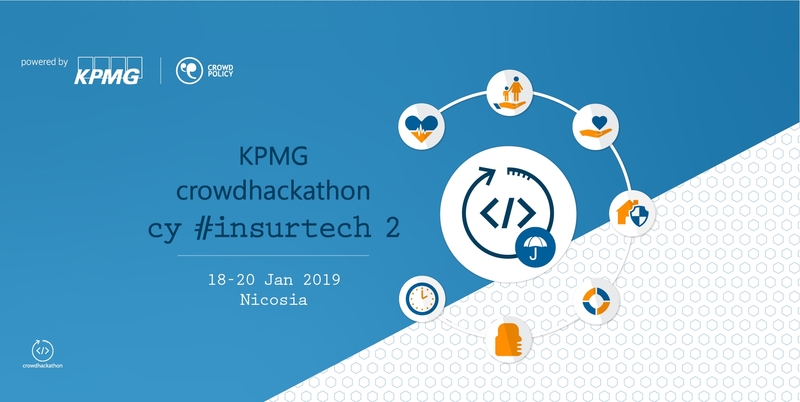 KPMG in Cyprus is putting together a hackathon to develop and showcase new tech solutions and create startup opportunities, synergies and partnerships within the insurance industry. Applications promoting Social Innovation and Social Solidarity. Participation is FREE; there is a limited number of slots per role; participation is on a first come-first served basis. Acquiring skills that will help you correctly design and transform ideas that solve real-life problems into apps. Preparation in time-pressure conditions with the guidance of mentors with significant market experience. Networking of young developers and participants with experienced business executives, professionals of the insurance sector and entrepreneurs. Comprehension of the overall business culture and ecosystem through the utilization of information from the insurance sector which holds a key position in the market. Work with awesome people, win money and found your startup at the same time! More information about the web site, technical specification will be soon available! !